This may be more interesting to the Bay Area locals, but I figured other people might find it neat as well. This is an old newsreel about the Bay Bridge opening up back in 1936. I love the style with which this news is presented. It’s exciting and sensational and for good reason. 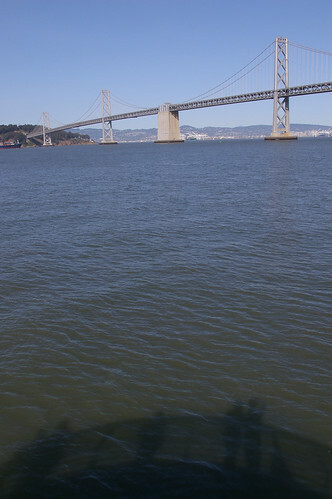 * The Bay Bridge is 44,352 ft (8.40 miles) long. * One of the busiest bridges in the US, carrying approximately 280,000 vehicles per day. * Construction began on July 9, 1933, with the bridge opening on November 12, 1936, causing one of the greatest SF traffic jams ever. * The total cost came out to $79.5 million (equivalent to $1.07 billion in 2005 dollars). * The toll started at 65 cents, dropped to it’s lowest of 25 cents. * The current toll for autos is $4, collected only for westbound traffic. For comparison, the original $0.65 toll in 1936 would be $8.62 in 2005 dollars. * The dirt excavated for the Yerba Buena tunnel (the largest diameter tunnel in the world) was used in part to build Treasure Island. * Construction for a more earthquake-resistant replacement on the eastern span began in 2002, with an initial completion date slated for 2007. Now they’re looking at somewhere around 2012 or 2013. The people behind possibly the best video… ever. Heather and I head back across the Bay Bridge late at night after the Xmas party at Nimby. There’s something I just love about the Bay Bridge. Both it and the Sutro Tower represent SF for me.